The past week has played like a paid advertisement for the value of film societies like Cinema 100. I had not yet seen “Hud” when we selected it as a classic for the series and was excited to be able to finally see it – and on the big screen. Planning to write this review, I queued it up through Netflix and sat back to await its arrival in my mailbox. Sadly, Netflix didn’t send it to me (which means few copies in stock, none currently in Minneapolis). Yes, Bismarck/Mandan is in for a rare treat – even more so than I thought a week ago – when Cinema 100 brings “Hud” to town. Ravishingly shot in Oscar winning black and white, “Hud” is a feast for the eyes sure to fill an expansive Grand Theatre screen. Before we first meet Hud Bannon, played by Paul Newman, we learn that he drives a pink Cadillac and has a propensity for leaving bar owners sweeping up broken glass in his wake. We first meet him having a reckless affair with a married woman followed by his crafty escape from said woman’s home-returning husband and a fast-driving getaway in that pink Cadillac. This is a quick, efficient, and dazzling introduction to Newman’s character, essentially a man with his own personal moral compass – or lack of one if you prefer. To his father Homer, played memorably by Melvyn Douglas, Hud says, “I always thought the law was meant to be interpreted in a lenient manner.” It stands as Hud’s motto, much to Homer’s distaste and dismay. This father and son ethical divide is what propels “Hud” through it dramas and toward its desolate conclusions – including a dented pink Cadillac. What I most enjoyed though is how it stylistically plays with the idea of old and new by mixing classic Hollywood with the method acting style of Newman, anticipating such near future films as “Bonnie & Clyde” with Warren Beatty. Classic Hollywood style is exemplified by controlled studio conventions. Method acting is all posturing and spontaneity. The entrance of method acting into Hollywood was an advance of liberalism toward the long-standing conservatism that had pervaded the industry. “Bonnie & Clyde” was a culmination. “Hud” was a stepping stone. An example is the use of rear-projection shots in driving scenes. They were staples of Hollywood and already cliché by the time “Hud” was filmed, even laughable. Cars would twist and turn down winding roads with the driver hardly moving the steering wheel. 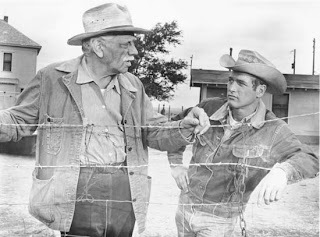 “Hud” takes knowing advantage of its milieu of endlessly straight roads to turn these rear-projection shots into the perfect setting for Newman’s posturing. He can lounge about behind the wheel in as many cool poses as he can conjure and never once have to worry about turning the wheel more than a nudge. “Hud” has the old and the new still finding at least a stylistic a way to get along in 1963. By 1967 and “Bonnie & Clyde,” the new had completely taken over. You must not have checked Cashwise, because I just rented "Hud" from there yesterday, ha ha. Thanks! I also didn't have to take out a loan to get it either, which I am going to assume you did at Blockbuster. Either that or you traded in your first born child and a sack of diamonds. Seriously, that place is ungodly overpriced. Why would I rent something there when I can go to Cinema 100 for (averaged out) the same price?